We've probably all heard of a Ponzi Scheme, and have at least a vague understanding that it's a type of investment we want to avoid. Named for Boston businessman Charles Ponzi (who promised investors a 50% return in just 90 days based on arbitrage in International Mail Coupons) these deals snag investors with promises of high, consistent returns, and little to no risk. Charles Ponzi, 1920. Via Wikipedia. And for a while, these schemes can actually deliver on their promises -- as long as the pool of investors continues to grow exponentially. There is no legitimate "business" here, no real sales or creation of wealth; the scheme depends on paying returns out of new investments, rather than profits. Without a constant influx of new investor dollars, a Ponzi scheme will fall apart and the promotor will be caught or disappear. Photo via WREX, story and news coverage here. There were many more empty chairs than pictured here, only 6 residents attended the meeting. Last Wednesday I attended a Community Input session held by the Water Division of the City of Rockford. The purpose of the meeting was to solicit feedback on proposed rate hikes which are intended to provide an additional $1M for the "Water Pipe Replacement Program" which currently accounts for about $1.5M of the Capital Improvement Plan (CIP) funds allocated to the Water Division. (view full 2015-2019 CIP; Water Division begins pg. 76). Tim Holdeman, Water Superintendent, explained the expanse of the water system and the various threats that impact the City's ability to reliably provide the highest quality water to all residents. These threats include the size of the system (850+ miles of water mains, 26 wells) and decrease in water usage (due to increased industry efficiency, decreased number of residential users, better water conservation by business and residents, recent cooler, wet summers, etc.) resulting in decreased revenue. But the major threat is the age of the mains. Here come a lot of statistics, stick with me, I'll try to be as brief and as clear as possible. 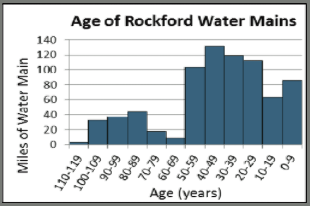 Slide from Water Division presentation, graph showing miles of pipe at each age range. The average life expectancy of a water main is 70 years. About 20% of the City's water mains are older than this, some as old as 120 years. According to the current CIP, "Replacing all the water mains older than 70 years would cost approximately $200 million...replacing the highest risk water main would cost approximately $21 million." But wait, there's more! According to the flyer distributed to residents along with our water bills, "The City should be replacing 3-4 miles of water pipe per year. Currently we are replacing about 1 mile per year. It costs between $1.5 to $2.5 million per mile to replace water pipe." Feeling nervous yet? We're just getting started. Back to the CIP: "Because the capital improvement needs are so much greater than available funding...the highest priority projects are considered for further analysis and funding. If the funding is available, the project becomes programmed...then...it is taken before City Council where if approved it becomes committed....A project may also be driven to become programmed or committed based on roadway projects that are committed by other Divisions or State entities....The cost of committed and programmed projects for 2015-2017 are about twice the Water Replacement and Improvement Account (WRIA) budget." Let's take a step back and consider this information, taken word for word directly from the City's own documents. Pipe that is 70+ years should be replaced, and we've got 120 miles of that. We'd need $200M to do it, but currently we're spending only $1.5M a year. At this rate it will take 133 years to replace the pipe that right now, today, is already 70+ years old. And you're only asking for $1M more each year for the next 5 years? Holy Sh*t we've got a problem on our hands. Compound this problem with the fact that, as the CIP states, projects are often added on to the WRIA budget based on other projects, typically road work (when it makes sense to replace mains if the road is already torn up). But these are projects that the Water Division cannot necessarily anticipate, projects which may not replace the mains that are at the top of the priority list because they are at the highest risk of failure. The 2015 CIP WRIA budget is $5M, and the project breakdown lists 10 committed and 9 programmed projects, for a total of just over $9M, or a deficit of over $4M. Currently the 2019 CIP breakdown lists only 3 committed and 2 programmed projects with a projected surplus of $3.3M; I asked Mr. Holdeman how likely it is that the 2019 project list will expand to meet or even exceed the number of projects in the 2015 and he responded "Very likely." Slide from Water Division presentation, graph shows number of repairs to water system. Compound this problem yet again with a series of very cold winters, and overall repairs increasing by 30% (not surprising considering all the other factors). The Water Division attempts to hold reserves of $3M to address unexpected breaks, but Mr. Holdeman stated that in the winter of 2013 alone unexpected main breaks used up $2.2M of the reserves; add right on top of that the fact that reserves are being used to pay for those pesky unpredictable committed and programmed projects. So, where does that leave us? And why did I begin this tirade by defining a Ponzi scheme? Consider carefully the language used on the City's website: "The City of Rockford Public Works Department is pleased to present the 2015-2019 Improvement Program, which proposes $139M of infrastructure investment throughout the City." Here, investment and improvement are very loaded words. "Improvement" implies that the work to be done will leave the system better than it was before, more ready to provide the service for which it was intended. In the case of WRIA, the improvement is so negligible in light of the size of the system and the scope of the problem, it barely registers. And "Investment"? For over a century the people of Rockford have been investing in a system that was flawed, faulty, doomed from the start. A system that promised little to no risk and depended totally on the expansion of users to fund not reinvestment in the original system but growth, growth, growth. Sound familiar? Take another look at the graph of the age of pipes in our system. The pipes that are 70+ years old are certainly a problem. But I see another problem that is just a few short years down the road, certainly fewer than 133 years down the road. There are nearly 500 miles of pipes that are 20-70 years old, and where did the return on the "investment" of building those pipes go? Was it paid back to investors with interest? Well, if you count being able to turn on a faucet or flush a toilet a "return on investment", perhaps, but that's not really a return on investment, it's a service in exchange for payment. Did the return on investment at least go back into the water system, to maintain and replace older pipes? Ok, one more recap (and I promise it's the last): 120 miles of pipes 70+ years old, an out of balance CIP, and proposed rate increases that won't even make a dent...honey, we're in over our heads and the lifeguard is very busy fixing a parking garage (which, by the way, has little chance for a return on investment, either). We've done Ponzi proud, folks. And I'm not blaming the current administration, the trouble started long before them. For decades we've been buying into a flawed development scheme that "entices cities to exchange near-term cash advantages of new growth for the long-term maintenance obligation..." and the failure of our cities to remain solvent, to provide the most basic of services to their residents, is a serious problem. But it's only part of the problem, because our cities, including Rockford, continue to buy into this scheme, the promise that just building one more road, widening a few more lanes, allowing new development to add 8-9 miles of pipe to the City's maintenance obligations a year, will somehow right the ship. I have a call in to Mr. Holdeman with a few more questions, mostly because I want him to tell me I'm wrong, that the system isn't as doomed as it appears (I'll amend this post with any answers that add light to the situation). He, like most city employees I have encountered, is a pleasant, capable, intelligent person who is committed to doing their best for the City of Rockford. But the system? It's broken, y'all. If I thought doubling our bills was the answer, I'd gladly pay twice as much for water service. But the choices are going to get much, much harder than that before this Ponzi scheme crashes and burns (and by then, our water system may not be reliable enough to put the fire out). Newer PostWater Main Update: Let's hope the band-aid is waterproof.